As a mom of 5 and honorary "foster mom" to tons more kids in the summer, I found this book to be full of tips, smarts and humor. I found some great new things to try, including apps to download to save money and put recipes together for me, as well as blogs to check out and much more. The recipes in the back were a nice surprise! Here is the book description on Amazon and the purchase link is here! How to save money on groceries is a popular topic.This is because within most family budgets, there isn't a lot of wiggle room.You can't usually change the dollar amount of your mortgage, rent or car payment. The weekly grocery bill is one of the few places a person can save a few dollars. But how? Food costs have increased in recent years and many families have food allergies or intolerances that require the purchase of more expensive food products. 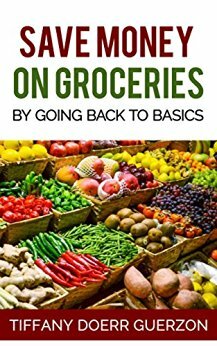 In this book, I share what I have learned about saving money on groceries through years of trial and error. I have found that a “back to basics” approach works best for me. Many of these cost saving methods—such as buying in bulk, stocking up, cooking from scratch, buying on sale, and planning meals—are probably strategies our grandparents used. By going back to basics, I can save significantly, without clipping coupons or driving to several stores each week. I also include information on saving apps, batch cooking, alternative buying methods such as food co-ops, and how to read price labels at the store to decipher the best deal. I also include tasty, nutritious recipes. While I can't promise you will save a certain percentage on your grocery bill, I can say that by following even some of the saving methods in this book, you can gain control over your grocery spending.